Tetris is the brainchild of Alexey Pajitnov, who created it while he was a computer engineer at the Dorodnitsyn Computing Center in Moscow, Russia. While Pajitnov was growing up he enjoyed playing games that use pentominoes (a portmanteau of “domino” and “penta,” meaning “five” in Greek). He initially wanted to create an electronic game that uses pentominoes, but found that they would make gameplay complicated; so he chose to use tetronimoes instead (“tetra” is Greek for “four”). This was a brilliant design decision because it allows for depth without complexity. Pajitnov designed this game, which he called “Tetris” because of the tetronimoes, to test the hardware capabilities of the Elektronika 60 computer at his workplace. The game proved to be very popular with his employees, all of whom were later sent to the gulag for goofing off during work . Two of Pajitnov’s co-workers ported Tetris to IBM PC and copies started spreading life wildfire throughout Moscow. The few soviets fortunate enough to afford a computer were soon hooked to Tetris. It was only a matter of time before this game caught the attention of the West. Tetris‘ journey from the USSR to the US is detailed in the great documentary “Tetris – From Russia with Love.” I highly recommend you watch it. (Just don’t laugh when they repeatedly dub a sound effect from Donkey Kong over a video of a boy playing Super Mario Bros. 3 around the 19:00 mark.) It’s interesting to learn that, in the closing days of the USSR, the soviets wanted to open trade relations with the West (strictly on the Kremlin’s terms, of course) and thus were open to the idea of licensing Tetris. Through a complicated process (seriously, I highly recommend you watch the documentary) Nintendo was able to secure the handheld rights and console rights for Tetris. This is directly responsible for the massive success of the Game Boy. You see, Nintendo had a choice of which game to package with the Game Boy in 1989. The obvious choice at the time was Super Mario Land, since Mario was their mascot and Super Mario Bros. was, at the time, the best-selling game in history. SMB had been bundled with the NES for years–it seemed the logical choice for Game Boy as well. But Henk Rogers (owner of Bullet Proof Software) slyly convinced Arakawa Minoru (NoA CEO) to bundle Tetris, saying, “If you want little boys to buy your machine include ‘Mario,’ but if you want everyone to buy your machine, include Tetris,” The Game Boy version of Tetris went on to sell 35 Million copies, so I suspect he was right. Henk later said, “Tetris made Game Boy and Game Boy made Tetris.” Millions of us can remember our childhood sessions of Tetris; the familiar black-and green blocks etched in our minds’ eyes. My first experience with it was in the waiting room of an orthodontist’s office in the early 90’s. Every time I went I got to play a game or two while waiting for my sister’s appointments. I was terrible at it. And as you’ll soon see, I haven’t improved much since then. 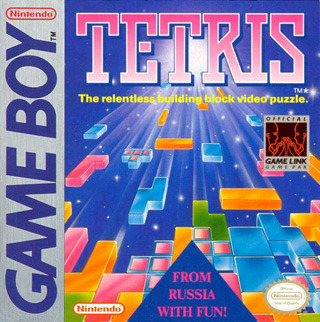 There have been many, many iterations of Tetris (some great and some… not so great (mirror)) but I chose the Game Boy version because it’s the most iconic version, it’s the version that I grew up playing, and it’s Alexey Pajitnov’s favorite version. The Game Boy version is simply timeless, despite its lack of color or extra features. Maybe the most enduring facet of the Game Boy iteration is its soundtrack. An old Russian folk tune called “Korobeiniki” was arranged for Tetris and has become instantly recognizable to gamers everywhere, taking on a life of its own. It’s wonderful to think that millions of Americans and Japanese learned about a bit of Russian culture without even meaning to. See, this is one of the things I love about gaming. This is tangential learning at its finest. Games can educate without having to be electronic textbooks. And if even one gamer wants to learn more about Russia because of a Game Boy game, I say that’s wonderful. I think I’d better stop there or else I’ll get all teary-eyed. Anyway, that’s Tetris. If you’re one of the few individuals on Earth who hasn’t played it yet, or if it’s been a long time since your last game, you owe it to yourself to play. After the success of Tetris, Pajitnov went on to make several more puzzle games, including variants of Tetris. One of his most interesting variants, I think, was the arcade game Welltris, which has a top-down perspective, as if the player were looking down into a well and watching the pieces fall down the walls. Unfortunately none of Pajitnov’s other games were as successful as his first, but considering how high he set the bar I don’t think that’s anything to be ashamed of. Next time, we’ll be looking at a very different puzzle game of sorts, which was an arcade hit in 1984. Tetris can be purchased here.